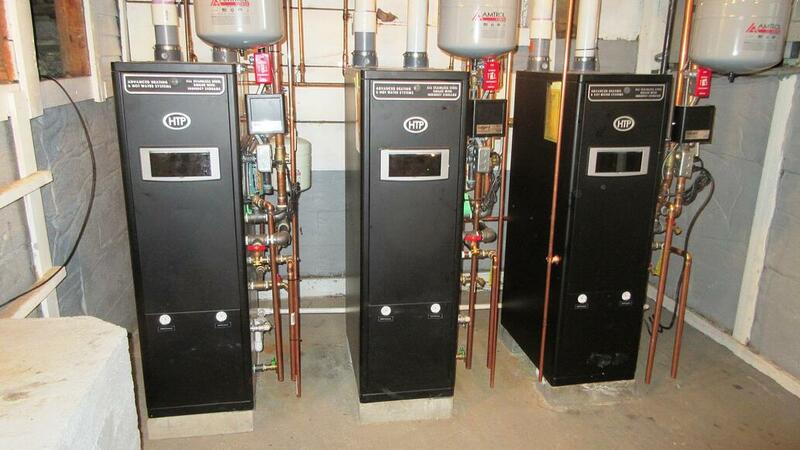 Check out this awesome installation of our EFT Combined heating and domestic hot water appliance in New Hampshire! These three high efficiency floor combi units were installed in an older three story apartment building. The combination units supply domestic hot water and baseboard heat. There is one unit to each floor of the apartment. The units were installed by Heritage PHCE. Our EFT Combi Floor Standing unit has a 93% AFUE. The modulating technology matches fuel consumption demand to provide high system efficiency during low load conditions. It has a 5 to 1 turndown ratio, allowing the unit to modulate at lower firing rates which reduces short cycling, conserves energy, and improves component reliability. Its durable 316L stainless steel fire tube heat exchanger provides higher efficiency and a lower pressure drop. It is also ultra low NOx compliant, making it eco-friendly.